When I started experimenting in the kitchen, I wasn’t trying to cook, I was trying to bake. Baking is my first love. Surprisingly, I started not with cookies, nor with muffins or cupcakes; I started with fancy layered cakes with different kinds of mousse fillings and homemade lady fingers. Those cakes turned out so great, that a few of my friends actually paid me to make them for their special occasions. After I enjoyed a brief success of those desserts, I started thinking about baking in general and for a few short months I toyed with an idea of opening a *gasp* bakery. I gave up that idea, but it prompted me to consider baking a bit more seriously and I actually went to a baking school. For about a year I took night classes 2-3 times a week and then came to work with assortments of cookies, muffins, cakes, breads, pastries, chocolates etc. My colleagues loved me! My waist hated me. I don’t bake as often as I used to (it is a coincidence that my last few posts are all about baking), but I enjoy it a lot. I use cookbooks and cooking websites religiously. I am not good at making something up. However, I’m pretty good at modifying existing recipes. This recipe is a good example. It started with a bit different ingredients and proportions and after a few years, it finally turned into these fluffy, moist, caramel-coloured little cakes. I know, I know, real cupcakes are supposed to have frosting, but I am not a big fan. In fact, I am not a fan at all. I never eat frosting on cupcakes. So, here I put a little surprise in the middle to make up for the lack of icing. In a big bowl, combine soft butter and brown sugar. Using a hand mixer, mix it together until mixture is light and fluffy, about 2-3 minutes. Add orange oil if using and mix. Add eggs one at a time and mix between each addition. Mixture may separate, but it’ll come together again. In a separate small bowl, combine flour and baking powder. Mix. Add half the flour mixture to the butter mixture and mix with a spatula. Add the rest of the flour mixture and mix with a spatula just until flour disappears. Do not overmix. 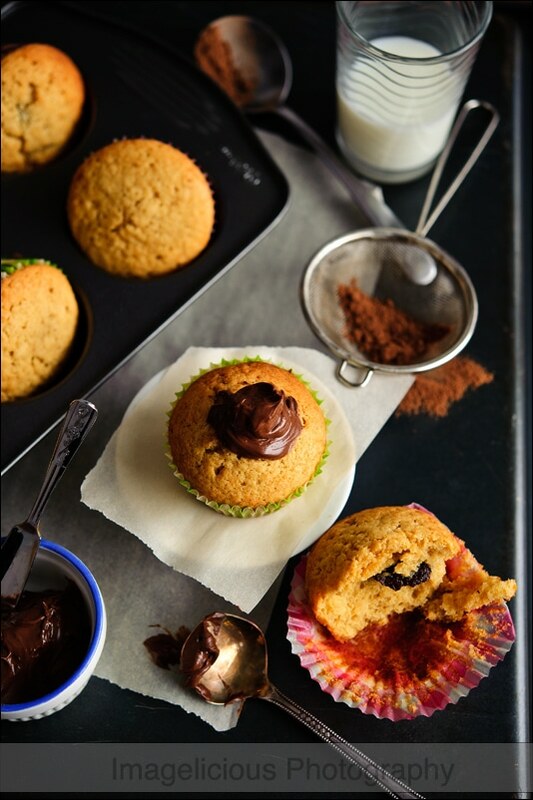 Line the muffin tins with cupcakes liners. Fill the cupcake tins halfway with the batter. 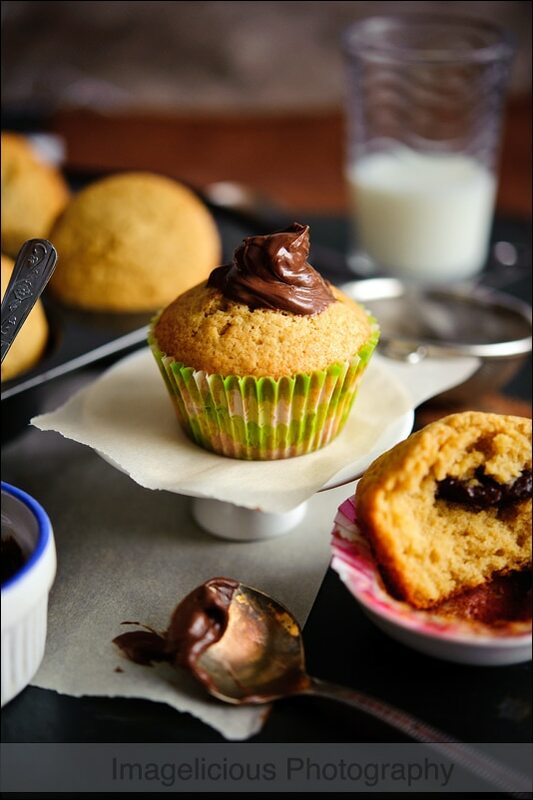 Add Nutella, about 1/2 teaspoon for each cupcake. Bake for about 20 minutes or until cupcakes are baked through, rotating the pans in the middle of baking. 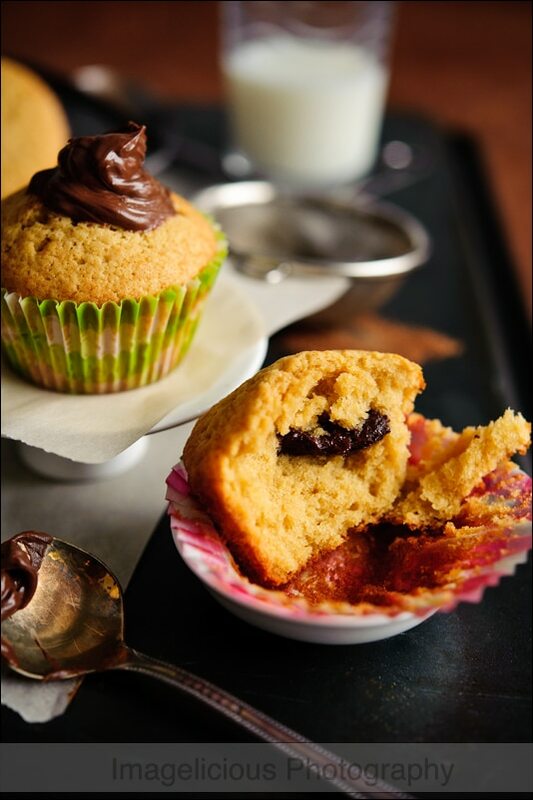 I used to make these cupcakes with regular white sugar until one day I started making them and it turned out that I had only brown sugar in my pantry, so I used that instead. I was very pleasantly surprised. Brown sugar gave the cupcakes not only beautiful caramel colour, but also a slightly nutty caramel flavour. I have not made this recipe with white sugar since. I’ve been using Boyajian Pure Orange Oil for the last eight years or so. It’s one of my favourite secrete baking ingredients. It is natural and has no preservatives, it tastes and smells absolutely amazing and it’s much easier to use than zesting oranges. I made these little cakes with Nutella, homemade ganache, store-bought orange-chocolate jam, chocolate and toffee chips, you name it. Looks very yummy. You’ve combined two of my favorite things: Nutella and Cupcakes.. can’t go wrong with that.